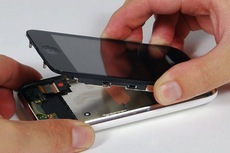 How do you take apart an iPhone? I also ran into the very same predicament. I found a lot of tutorial videos on the internet on how to do it, but was shortly reminded by my dad that I’m not very technologically or mechanically suave. For the time I spent trying to find a cheap screen replacement and the tools to do it, I gave up and found a pretty cheap place to do it called midwest iphone repair. They were really fast and reasonable. But good luck to you! You’re a better man than I.